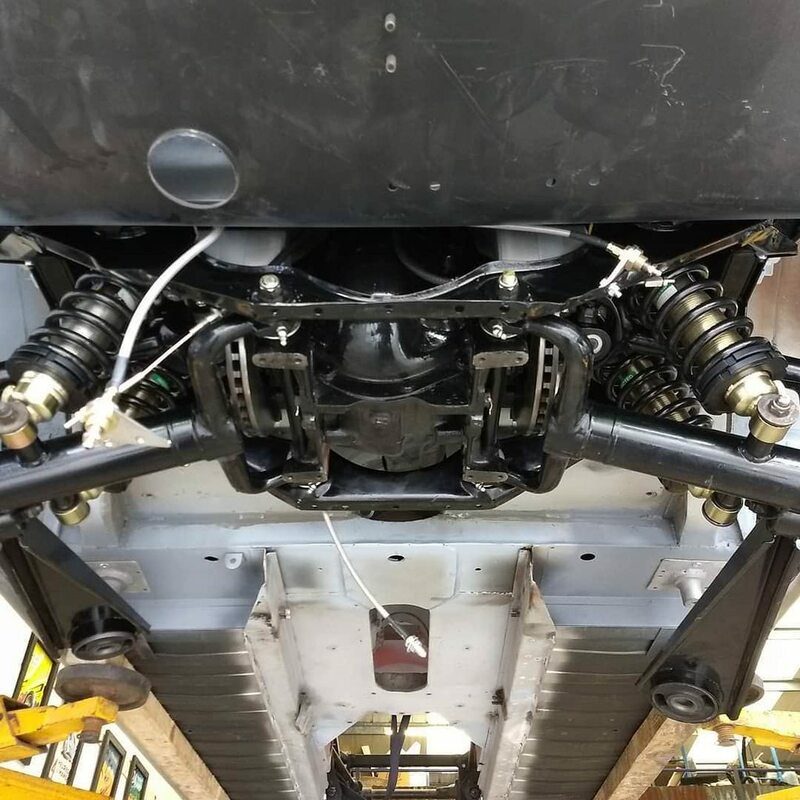 Series one Independent rear suspension (IRS) overhaul? #1 Series one Independent rear suspension (IRS) overhaul? Some advice from the collective and those who have overhauled their IRS please. What parts will i need to complete this task? It looks very much like it has never been out of the car before. Everything is just about working including the handbrake although the brakes were marginal on the last MOT test and the dampers are soggy. I have some play in one rear wheel bearing and the occasional clonk from the rear end when pulling away??? I intend to change ratio from the 3.54 while I am there too. My replacement diff is not leaking oil. There is very little rust on any of the components or cradle. The brake discs are shiny and flat. 2 inner fulcrum kits C1716FK. 2 Outer Fulcrum kits C16029FK. 2 Wheel bearing kits JLM9732. I will overhaul the rear brake cylinders with new pistons or replace complete as necessary. I will overhaul handbrake mechanisms and fit new pads. Fit new radius arm bushes. I have taken an IRS out in the past to overhaul the Prop Shaft I know what to expect in terms of weight and tools etc. Are there any other parts I should add to the list before I start? I realise I’m likely to need other items once I have it in bits. #2 Re: Series one Independent rear suspension (IRS) overhaul? New Metaloc nuts for the flanges. #3 Re: Series one Independent rear suspension (IRS) overhaul? You might want to consider part C22955SWB - the handbrake compensator upgrade - which addresses a point of MOT common failure. Fosseway also sells (or used to) a handbrake compensator kit. #4 Re: Series one Independent rear suspension (IRS) overhaul? Oh yes, half shaft UJ’s, of course. Now added. And thanks for the tip on the felt seal swap for lip type. I‘ve also added anti role bar bushes to the list. Thank you for the advice on the handbrake compensator and brake bleed extenders and pics too. I see you have vented discs on the rear. My rear brakes are standard at the moment, I have four pots on the front. I have read that it is an upgrade to put my now redundant front piston/cylinder assemblies on the rear. If this is in fact a possible and my fronts are usable it would be a good idea as I could make a start on these now before taking the car off the road. #5 Re: Series one Independent rear suspension (IRS) overhaul? While you are at it fit remote brake bleeders. Fosseway amongst others sell a kit or make your own. #6 Re: Series one Independent rear suspension (IRS) overhaul? I’m doing mine this winter too! Not sure there's much point in moving the front calipers to the rear, IMHO, I have cooper upgrades on the front and standard on the back on my 62 Coupe and they’re more than adequate. Best to leave a gap and not risk locking up on sudden braking! #7 Re: Series one Independent rear suspension (IRS) overhaul? I have four pots on the front. I have read that it is an upgrade to put my now redundant front piston/cylinder assemblies on the rear. If this is in fact a possible and my fronts are usable it would be a good idea as I could make a start on these now before taking the car off the road. If you've got more braking force at the front then you should put the larger Dunlop pistons on the rear. 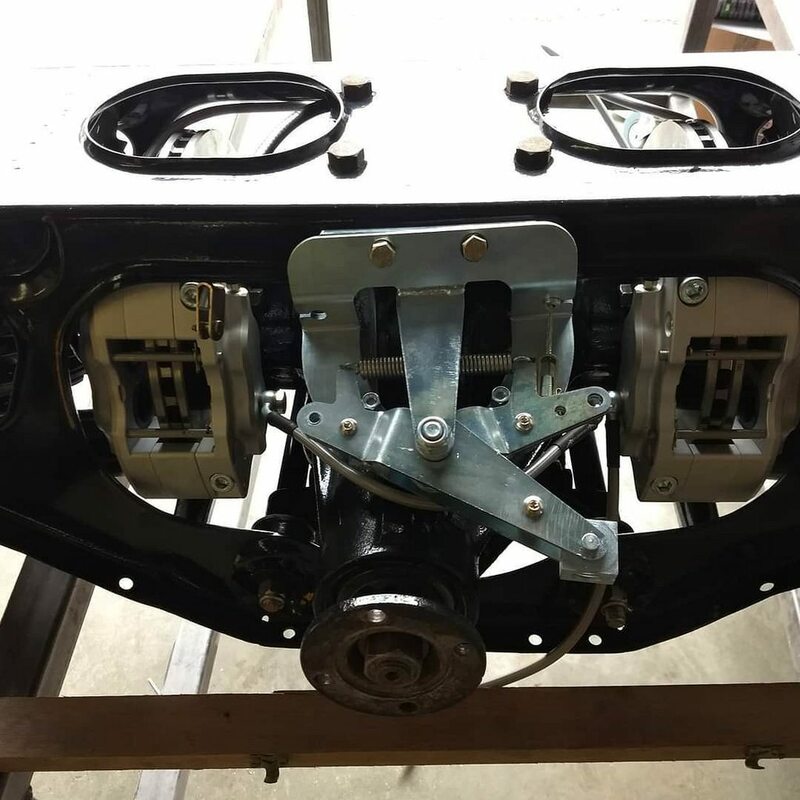 #8 Re: Series one Independent rear suspension (IRS) overhaul? It’s not too difficult to do the diff output seals and pinion seal so I would do those on yr new diff, also use the later pinion seal. Don’t be tempted to replace your rear coil springs with modern repro ones from the usual suppliers as they are rubbish and will give the wrong ride height. Rear splined hubs tend to wear where the bearings are pressed on so may need replacing. Take the opportunity to take the back cover off the diff and have a visual check, I’ve had to rebuild two rear axles recently that didn’t leak and turned freely, one was a power lock which had contaminated oil and had destroyed the friction plates and the other was off an xk120 which had teeth broken off the sun and planet gears. #9 Re: Series one Independent rear suspension (IRS) overhaul? I’ve just finished doing mine, pretty much everything that moves/wears ended up being replaced in the end. I think you’ve covered most things on your list. I bought my bearings direct from a bearing supplier, rather than the usual Jag suppliers. That way I could ensure I got Timken. I was able to reuse the old spacers from the wheel bearings, but had to buy new shims for the outer fulcrum to get the correct preload. As I swapped the diff for a new one, I had to re-shim the inner fulcrum shafts. You might need new spacers to centre the discs if you replace those. I would recommend replacing the discs whilst it’s out, unless yours are unworn, as the IRS needs to come out again to replace them. I made new rigid brake lines whilst everything was out too. Check your splined hubs for wear too, though these can be replaced later without removing the IRS if necessary. #10 Re: Series one Independent rear suspension (IRS) overhaul? If the replacement diff is from a later series, I would look at changing the Crown Wheel and Pinion in your original diff housing, at it has a much superior bearing pre-load system than used in most S2 and S3 cars. The correct bearing for the output shafts is no longer available. The correct bearing is a double row, angular contact ball bearing race, 29mm wide, with a split inner race that when assembled and nut the tightened on the inner race, pre-loads the bearing. The available replacement is 27mm wide and therefore requires 2mm thick spacers. Its inner race is not split and there is no pre-load built into the bearing. I suspect that the Output Shaft Bearings in your original diff will be two opposing taper roller bearings (per side) using as solid spacer between them. Your original differential uses shims to set the pre-load for the Pinion Shaft bearings; final analysis of the pre-load is to check the torque required to rotate the shaft. Later system uses a Collapsible Spacer between the bearings, that is supposed to soak up the required amount of the 120lb/ft to 140lb/ft torque applied to the Companion Flange nut so that the correct amount of pre-load is applied to the bearings. There are so many ducks having to be in line for that to work that I've never seen one of the hundreds of differentials I've reconditioned check out satisfactorily with a pre-load check using the torque required to rotate the shaft method. In the majority of cases there has still been considerable end-float when the Companion Flange nut was tightened to the correct torque. The Collapsible Spacer was not introduced because it was a better system in mechanical terms, but that it was quicker in mass production assembly; assemble the parts, tighten the nut, job done. Cheap and nasty. The modification used to convert to the collapsible spacer for the Pinion Shaft system was to move the shoulder where the shims located, on the earlier shaft, closer to the inner bearing to facilitate the length of the collapsible spacer. To employ the earlier system to set the pre-load, a thick walled, non-collapsible spacer, of a length that will allow adjustment with shims needs to replace the collapsible spacer. Last edited by angelw on Mon Sep 17, 2018 6:30 am, edited 1 time in total. #11 Re: Series one Independent rear suspension (IRS) overhaul? Thank you all for this great advice. Exactly what I was hoping for. Much better to go into a job like this with some guidance. I will certainly ask for the superior Timken bearings and fit all new brake pipes and hoses. Very interesting info on early and later diffs. Seems sensible to replace all the diff seals. If they are not leaking now the seals are probably hard and old so will leak when back in use. #12 Re: Series one Independent rear suspension (IRS) overhaul? A good time to check your fuel line and connections too. 1967 Series 1, 4.2, OTS, RHD, Black. #13 Re: Series one Independent rear suspension (IRS) overhaul? I remember reading somewhere that the crown wheel and pinion from a 2.88 won’t fit in the housing for a 3.54. I swapped the whole diff over on mine, for a 2nd hand 2.88, which I suspect came from an XJS. I cleaned and painted the outside of the new diff, and removed the rear cover to inspect the insides. Nothing looked particularly worn, so I decided to leave as is, particularly as I wasn’t sure all the bits are available to refurb everything completely. So far it’s silent and doesn’t seem to leak oil, so that gamble paid off. Make sure the replacement diff has the same style brake mountings as your original, they’re not all the same. #14 Re: Series one Independent rear suspension (IRS) overhaul? I am intending to do the same swap as you. My replacement 2.88 is also not leaking and all looking good on the inside. So, fingers crossed.